A beautifully presented gift box of tea. These authentic blends are designed to provide a somewhat immediate effect, even after a few cups. This is the perfect gift to wish someone 'get well soon'. 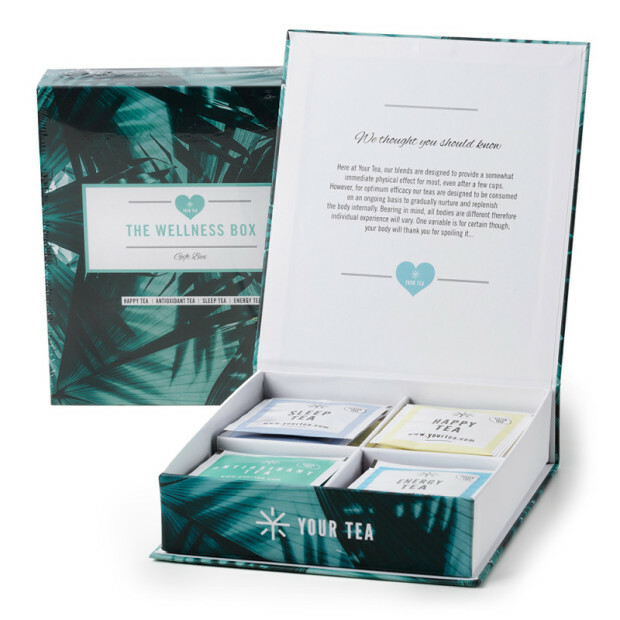 The collection includes Happy Tea, Antioxidant Tea, Sleep Tea and Energy Tea. Happy Tea includes the following: Happy Tea with Chrysanthenum, Barbary Wolfberry Fruit, Hawthorn Fruit, Lemon, Rose Flower, Chinese Red Tea. Antioxidant Tea includes the following: Antioxidant Tea with Oolong Tea, Ginger, Chrysantheum, Goji Berries. Sleep Tea includes the following: Sleep Tea with Malt, Lily, Ju Jubel, Lotus, Liqourice Root, Lavender, Chinese Red Tea, Gynostemma Pentaphylia, Rose. Energy Tea includes the Following: Energy Tea with Phoenix Tail Fern, Ginseng Flowers, Mentha Haplocalyx, Orange Peel, Lavender, American Ginseng, Chinese Green Tea, Du Zhong.